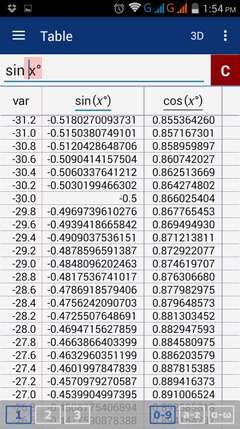 A table of trigonometric functions can be used to solve missing lengths for sides of a right triangle or any triangle that can be divided into right triangles. It can also be used in conversion formulas such as formulas that switch between Celcius and Fahrenheit. In the input field, enter the trigonometric/circular function and include a degree symbol if the independent variable is measured in degrees (the default is radians).